Movie Review: Bride of the Monster (1955) Directed by Edward D. Wood Jr. The opening credits of Bride of the Monster roll against a backdrop scene of a very spooky-looking house on a stormy night. The rain lashes down, the lightning flashes and it looks like it has the making of a very good horror movie. For me, the looks were deceptive because I didn’t really enjoy the movie. If I ever have nothing to do on a stormy night though, and the rain is lashing down outside, I might watch Bride of the Monster for a second time. The spooky-looking house is the home of Dr Eric Vornoff who has only his manservant Lobo to keep him company. Lobo is supposed to look menacing and perhaps if I were 30 years younger he would look menacing, but to me what Lobo really looks like is a genie that has lost his lamp and had to take up alternative employment as henchman to a mad scientist. Vornoff is an exile from his homeland because his Russian comrades considered him a few tokens short for a pop-up toaster when he began to explain his theories about atomic energy and its untapped usefulness when it comes to making a race of superhumans. Now Vornoff travels the world and conducts his experiments in private and he seems to always take up residence in property that is near a lake. His present property is no exception and there appears to be a monster living in the lake, but that’s nothing new for the mad scientist. Apparently, when he was living near Loch Ness, Nessie suddenly started putting in an appearance. I am not sure what the Scottish Tourist Board would make of that one, but I suppose that they can’t prove that Nessie wasn’t the brainchild of a batty scientist with an unhealthy interest in nuclear physics. The area around Vornoff’s present home is not the safest place for a picnic or a spot of bird watching because (even if you forget about the crocodiles, and the monster doesn’t get you) Lobo has the charming habit of kidnapping people and then manhandling them onto the couch in Vornoff’s laboratory. Once he has them on his couch Vornoff straps the poor blighters down and puts something that looks vaguely reminiscent of a metal colander onto their heads. He then subjects them to a little unwanted radiation treatment that will either kill them or turn them into superhumans. So far Vornoff’s radioactive colander has been a total failure. In the guise of a monster hunter, a former associate of Vornoff, Professor Strowski, has been travelling the world in search of him. After Vornoff’s obvious success at places like Loch Ness, Vornoff’s homeland wants to welcome him back, whether he welcomes the idea or not. Needless to say, Vornoff has no desire to go home, so poor, old Strowski becomes monster bait. Meanwhile, a nosy female reporter has turned up at the lake and she too ends up in the clutches of the man that would make monsters. Unfortunately for Vornoff, Lobo gets the hots for little miss read-all-about-it, so he turns on his master. I am not going to tell you what happens exactly, but suffice it to say that Vornoff gets a taste of his own medicine, courtesy of Lobo, and becomes a changed man. He becomes a bigger man too or seems to until you notice that he is wearing a pair of built-up shoes that would not look amiss on the feet of the Pinball Wizard. 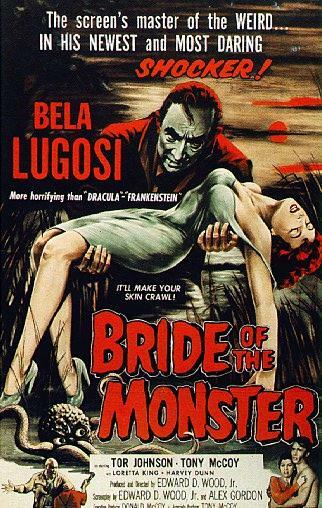 Bride of the Monster is not a particularly good movie, but I suppose it is a must-see for fans of Bela Lugosi (who is looking rather old in this one). Fans of Giant rubber octopuses might also want to give it a try.